I am a one person production, Due to the massive amounts of commission requests and emails pouring in since the SyFy interview I cannot keep up unless I switch to commissions. Purchasing this item guarantees you a 1 hour consultation via email and the ability to Purchase a 24-48 hour commission production time. 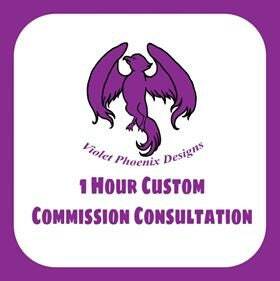 Commission Consultation Times Must be used within one Calendar Month. Payment plans of 24-48 Hour production time slots are available, please ask. Your 1 hour purchase will include a digital rendition you can use to provide Your color ideas and styles (I suggest using the PicsArt app) of your request before production starts and the amount of your total be put toward your finished order total. 24-48 hour production windows start at $75-150. This is the cost of most custom items but may go up depending on color, size and patterning alterations. This Listing will be re-opened only when there are open spots in scheduling so please add it to cart and set alerts for when it comes available. This will be the only way to guarantee your commission is considered. If you do not choose to purchase your production time after your consultation and digital rendition, this listing is not refundable.